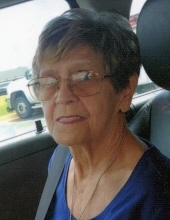 Mrs. Sandra Allgood Smith, age 76, of Rockmart, GA passed away Monday, March 25, 2019 at her residence. She was born in Rockmart, GA on July 2, 1942, a daughter of the late Lawrence Allgood and the late Edna Marks Allgood. Mrs. Smith lived all of her life in Rockmart where she served the community for forty five years as a cosmetologist. Sandra enjoyed listening to Gospel music and having large family gatherings. She loved her family dearly, especially her children and all of her grandchildren. She was of the Baptist faith. In addition to her parents she was preceded in death by her husband, Charles (Chuck) Smith on July 21, 2017 and her son-in-law, Mike Hobgood on October 30, 2018. Survivors include her three children: Mike Upton, Jr. and his wife Carla, Michelle Wood and her husband Duane and Melissa Hobgood, all of Rockmart; seven grandchildren: Michael Hall, Mathew Hall (Deanna), Max Hall, Kathy Hitchcock (Alic), Melanie Osborn (Brent), Chyanne Rogers (Gage) and Kanzie Upton; eleven great grandchildren; one great great grandchild; two sisters: Eloise Carroll and Joy Watford, both of Rockmart; and many nieces and nephews also survive. Funeral services will be held Friday, March 29, 2019 at 11:00 am in the chapel of the Alvis Miller & Son Funeral Home with Rev. Owen (Bud) Davis, Jr. officiating. Interment will follow in Rose Hill Cemetery. Pallbearers will include: Michael Hall, Mathew Hall, Max Hall, Alic Hitchcock, Mark Carroll and Mitchell Carroll. The family will receive friends Thursday evening from 5:00 until 8:00 pm at the funeral home and at other hours may be reach at the residence, 119 Sycamore Street, Rockmart, GA 30153. The Alvis Miller & Son Funeral Home & Crematory of Rockmart is in charge of arrangements for Mrs. Sandra Allgood Smith. To send flowers or a remembrance gift to the family of Sandra Allgood Smith, please visit our Tribute Store. "Email Address" would like to share the life celebration of Sandra Allgood Smith. Click on the "link" to go to share a favorite memory or leave a condolence message for the family.